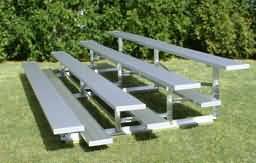 Our 4 row low rise bleachers have a first row seat height of 10.5" & a top row seat height of 28.5" so a guard rail is not required by code. Instant Shipping Quotes! 3Row 15'L Low Rise , Seats 30 Weight 249lbs. 3Row 21'L Low Rise , Seats 42 Weight 351lbs. 3Row 24'L Low Rise , Seats 48 Weight 410lbs. 4Row 15'L Low Rise , Seats 40 Weight 406lbs. 4Row 21'L Low Rise , Seats 56 Weight 537lbs. 4Row 24'L Low Rise , Seats 64 Weight 619lbs. 4Row 27'L Low Rise , Seats 72 Weight 675lbs. 5Row 15'L Low Rise , Seats 50 Weight 674lbs. 5Row 21'L Low Rise , Seats 70 Weight 919lbs. 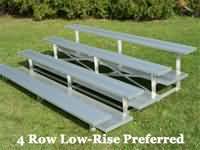 5Row 24'L Low Rise , Seats 80 Weight 1057lbs.